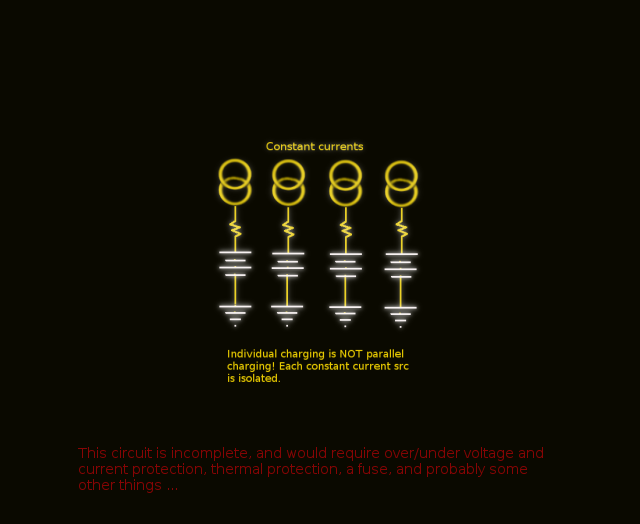 Figure 2: Individual charging is NOT parallel charging! The advantage of individual cell charging is obvious. One can monitor both the voltage and current on each cell, and (theoretically) adjust the parameters to obtain a proper charging result. This is all combined with the normal thermal and burp voltage monitoring, of course, so that one can “bail” on excessive variance from the proper charging paramters. 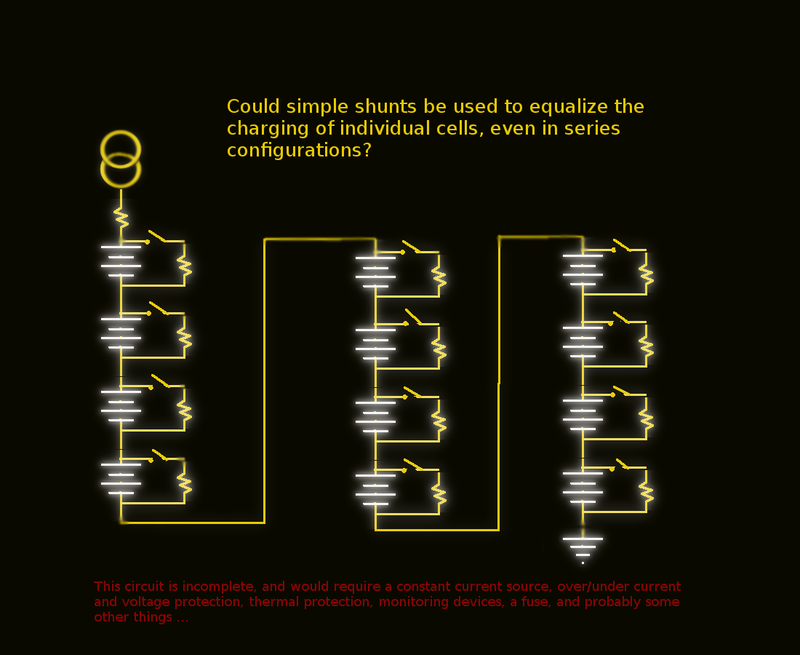 One cell may require more charge than another, and this could be taken into account. But, if we were to align the cells serially, how could we manage to have control over individual cells during the charging process? Could the answer be: shunts? Figure 3: Use of shunts. Is it reasonable? Unlike my original mechanical nightmare version of the charger (using relays to go from “individual” to “serial” and vica versa) – a shunting arrangement could probably use solid state relays. Even if mechanicals were used, it’d take only a couple 6-in-1 jobbers to do it. They come in 28 pin DIP size packages, which are pretty small. I’m still thinking about this one. The idea would be to equalize the charge (perfectly, or almost perfectly) – so that each battery cell would be completely, maximally charged, with no danger of overcharge. Sounds good, but how well would it work, with shunts? We could call it the shunted cell NiMH charger. Sounds catchy. We’d be adjusting the individual cell currents only marginally, in most cases, and I suspect a good compromise value could be found for the shunting resistors. We’d need to ensure that the shunt switches all stayed open except in the presence of a charging currect sufficient to keep the battery cell from discharging, or going into reverse. That part would have to be made fail safe. When power tool makers build battery packs, they attempt to match the cells, so that each charges about the same as any other in the pack. Then, they assume that when one cell has reached its charge, the others have also. In some packs, things aren’t quite that good, because they use only one thermistor to detect the charge. Ok, so how well does that work? Some say that most power pack failures are the result of a single shorted cell, deep inside the pack, where the heat builds up and cannot escape readily. If they put the thermistor deep inside the unit, it should help with this problem during charge, but what about discharge? That’s why the NiMH batteries in power packs don’t seem to last as long as my own NiMH batteries, IMO. It’s all my uneducated opinion, of course. In real life, I was a programmer. Now I sail sailboats in my mind. During the test of the middle-of-rehab “homemade” tablet, I measured all the voltages at the pick-off points. There were only six, as all of the batteries are not in place yet. The values, under load, in serial configuration? In the calcs (above), the equipment, just based on total voltage, cannot tell if the pack is just run down, or has a shorted cell. In the reverse case, a cell could be wildly overcharged, as compared to the others, and (voltage alone) would not tell the tale.